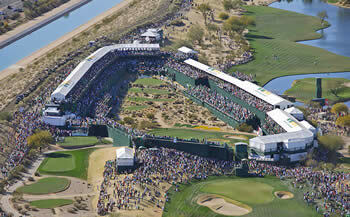 One of the most popular PGA Tour stops for the fans (and probably the golfers too) is the WM Phoenix Open. Played at the TPC Scottsdale, the Waste Management Open features the famous 16th hole Par 3 that is surrounded by stands that looks like a mini stadium and is known as “The Coliseum”. Famously this hole used to feature Caddie Races, but were banned by the PGA tour because of injuries sustained by the racers. The other great spectacle is the fan reaction to shots on the 16th hole. Miss the green and players are mercilessly booed to their ball. Hit the green and the crowd roars – Hit a Hole in One and the crowd goes absolutely bananas! To start playing fantasy golf immediately for this week's Waste Management tourney, check out our Top Fantasy Golf Sites list and create your winning lineups! The 2019 WM Phoenix Open will as always feature a huge number of top PGA Tour players in the field. As much as the fans enjoy the spirit of the event, the players love the rock star feel that they get too. 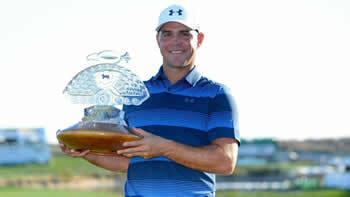 Last year Gary Woodland beat out the competition and comes into the 2019 Waste Management Phoenix Open as the defending champion. Who will win the 2019 Waste Management Open? If you know, then create your fantasy golf lineup at our affiliate partner site DraftKings and take advantage of the thousands of dollars they are giving away this week! Best of all – Sign up to DraftKings using the link below and get a FREE entry ticket into their PGA Birdie Contest. Play for a $100,000 grand prize…just for making a 1st deposit of $5 or more! It’s a given that you will be playing a fantasy golf lineup at DraftKings, but you should try out the golf game at FantasyDraft.com. They are a daily fantasy sports site that started offering fantasy golf in 2017. We have tried them out extensively since the start of the 2018 PGA Tour season and so far we’ve done pretty well with them cashing in some big wins. Try out FantasyDraft for their fantasy golf games and see if it becomes a regular site for you too. The Waste Management Phoenix Open is a tournament that is popular with the top PGA Tour players and the course history is a big factor. Even after a bad year, 3 time winner Phil Mickelson will be a pick many experts will be looking at. We trust out buddies at Golfstats.com for our expert golf picks so we won’t try to give you any of our picks…we leave that up to the experts!